The whole story of the day, and the previous frustrations, has been well told in other places by other writers but one mystery continues to linger. According to most twentieth century accounts of the launch, a man named Captain James Sever had the honor of christening Constitution before she slid down the launching ways into Boston Harbor. The tides were high and favorable, and at half-past twelve Captain James Sever stood on the heel of the bowsprit, provided with a bottle of choice old Madeira that had been donated from the valuable and well-stocked cellar of Hon. Thomas Russell, a prominent Boston merchant. She glided easily and majestically into the water, and was brought up with her starboard anchor within two hundred yards of the ways. As she then floated, she drew eighteen feet aft and fourteen feet forward. At first blush, the story seems credible enough. But if one asks the simple yet fateful question, “is it true?” things start to unravel. To begin with, none of the contemporary newspaper accounts of the event (and there were many), make mention of Captain Sever’s presence. Was it that his role was too insignificant, or was he not there? Sever was born in Kingston, MA in 1761. He graduated from Harvard n 1781 and immediately received an ensign’s commission in the 7th Massachusetts Regiment. He later transferred to the 4th Massachusetts Regiment and continued in service until 1784. After making several cruises to Europe, he was appointed one of the six captains approved under the Naval Act of 1794. Sever was appointed superintendent of the frigate building at Portsmouth, NH (the Congress) in 1795. The government suspended construction in March 1796 when the United States signed a treaty with Algiers. Construction resumed on July 16, 1798, and Congress was launched on August 15, 1799. James Sever served as her commander through the Quasi War. After a less-than-spectacular cruise, she returned to the United States and was placed in ordinary in 1801. 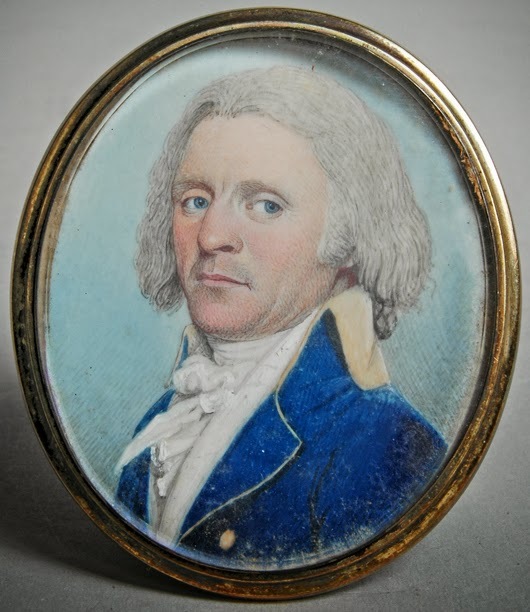 A portrait miniature of Sever, recently sold at auction, seems to confirm Morris’ assessment. This miniature portrait of Capt. Sever captures the austere severity of his personality. It was sold by Mid-Atlantic Auctions on April 7, 2012. He left the Navy in 1801, was involved with the Massachusetts Society of the Cincinnati, and died in 1843. According to historian Christopher McKee, Sever was “an avid and vocal Federalist” which might help explain his presence at the launch. The frigate was seen as a triumph by the ardent Federalists of Boston, while the Democratic press presented the ship and the failed launches as little more than a costly farce. It would have been easy for Sever to visit Boston, especially if the ship he was superintending had been put on hold. And yet, it is difficult to discover why, as a fairly high-placed representative of the federal government, he should be left out of every contemporary account of the launch. Perhaps more digging will reveal the truth about that day in October 1797. Ira Hollis, The Frigate Constitution: The Central Figure of the Navy Under Sail (Boston: Houghton, Mifflin and Co., 1900), 58. History of the United States Frigate Constitution, part 1, United Services Journal, 1891, 47. G.W. Allen, Our Naval War with France (Boston: Houghton Mifflin, 1909), 131. Charles Morris, The Autobiography of Commodore Charles Morris, US Navy, reprint ed. 2002, 4. Christopher McKee, A Gentlemanly and Honorable Profession (Annapolis, Md. : Naval Institute Press, 1991), 417.